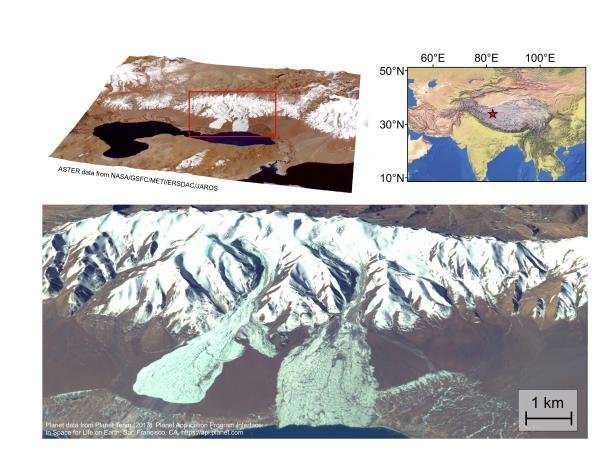 An international scientific effort determined the cause of a highly unusual and deadly glacier avalanche in Tibet in 2016, a new Nature Geoscience paper says. Planetary Science Institute Senior Scientist Jeffrey Kargel is a co-author on "Massive collapse of two glaciers in western Tibet in 2016 after surge-like instability." Andreas Kääb, Department of Geosciences, University of Oslo, Oslo, Norway, is lead author on the paper, which was published in Nature Geoscience. In July 2016, a glacier in Tibet—inconspicuous among thousands of others—did something documented on Earth only once before: almost the entire ice mass slipped off its bed, careening at high speed in a mighty avalanche, down slopes so gentle that ordinarily not even a small avalanche could occur, Kargel said. The mega-avalanche, one of the largest ever documented worldwide, killed nine herders and hundreds of their animals. "What happened next was truly remarkable. A neighboring glacier then did the same thing. It slipped off its bed, down a similar low slope, just two months after the first, creating another giant ice avalanche," Kargel said. "Fortunately, no other people lost their lives." A six-nation team of satellite remote sensing sleuths looking closely at the first glacier's demise were dumbfounded by the second event. The team found that both glaciers exhibited similar precursory slippage over their beds in the months and years preceding collapse, a behavior that indicated the penetration of meltwater to the bottom of the glaciers. This was a significant clue, because the glaciers occur at permafrost elevations between 17,000 and 19,000 feet above sea level, where the ice had been thought to be frozen solid to the ground. The fact that melting and basal sliding had appeared to be underway might be related to climate warming or increased summer rains. Another key finding was made by Kargel and Gregory Leonard (University of Arizona)—first based on satellite images, then confirmed by samples collected by other team members—that the bed is made of fine-grained sedimentary rocks, such as siltstone, sandstone, and clay. This is a rare type of bed for glaciers, where ordinarily mountains made of such soft rocks would be ground to mud in short order. The team thinks that the glaciers had been almost completely frozen and unable to slip and grind until recently. After enough water collected at the glacier bed, the glaciers started grinding the rocks and making a slippery wet mud that caused the glaciers to suddenly slide out of control when summer meltwater intruded. It bodes poorly for Tibet, where similar rock types, similar glaciers, and similar climate warming will likely result in more icy misbehavior. "There might be a nugget of insight for Mars where similar appearing giant avalanches have been a longstanding mystery," Kargel said. "If the Martian avalanches were of ice and various soft rocks, and a similar transition from totally frozen to partly thawed conditions took place—wham! The Mother of all Ice Avalanches!"